After almost three years, I still look back at this party and I’m amazed at how easy it was! While planning for my oldest son’s second birthday party, I was pregnant and due in a couple months. My newborn would be about 8 weeks old so I knew I needed something easy and low maintenance. As most two year olds are, he was obsessed with animals so I decided a jungle animal theme would be perfect. I was right! It turned out so cute and SO EASY. I was able to order almost everything we needed off Amazon. I highly recommend a jungle animal (or any classification of animals really) for any parent who needs a fun but super easy party for their little one! I designed the invitations myself then ordered the prints at vistaprint.com. Designing them was so easy. I searched for inspiration on Pinterest. That’s where I found the wording. Then I googled and found the clip art to use for the jungle animals. Finally, I arranged it all in PowerPoint and uploaded it to the website to order. It was so easy! I also made a matching cover photo for the Facebook event. If you don’t want to or don’t have the ability to make your own, Amazon has a ton of options for jungle animal theme party invites! In fact, if I would have looked at Amazon before making my own, I probably would have skipped it! I couldn’t find a banner or sign I liked so I decided to make one. These jungle animal print bags were super inexpensive so I bought them from Amazon and cut out the letters for the sign. I glued them on using some spray Elmer’s glue. I had some I hadn’t tried yet and this was a great reason to try it! I also used sticker printer paper to print stickers using the clipart jungle animals from the invitations. I placed these stickers all over the sign. 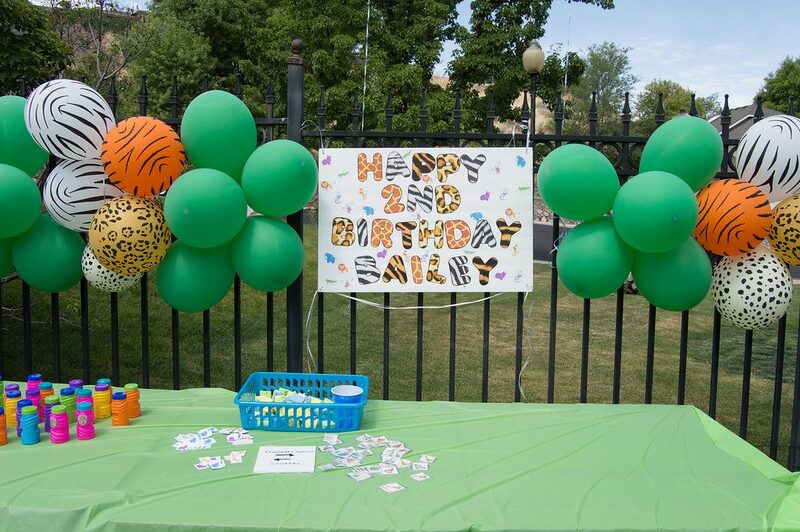 Unfortunately I couldn’t find any jungle animal print streamers, so I went with jungle animal print and green balloons instead. I didn’t want to waste money filling a billion balloons up with helium so I pumped them all with a hand pump. Then I tied them to the fence. I’m really happy with how it turned out. I also bought some huge jungle animal head mylar balloons. He had been begging for them at the grocery store for months. I found them for way less on Amazon though so I was able to get all five of them! I did fill these with helium. I was expecting a ton of kids of all ages so I wanted to make sure there was plenty for them to do. We had temporary jungle animal tattoos, DIY jungle animal stickers (see above! ), bubbles, a kiddie pool filled with ball pit balls, and punch balloons. I couldn’t find a jungle animal theme favor I liked, so I did pop fireworks and little sports balls instead. The wording for the sign just came to me one night and I was really proud! I thought the ball pit would be mainly enjoyed by the little toddlers and babies but even the older kids had a blast throwing the balls around. (I didn’t have a blast picking up the balls after, but it was worth it.) I cut up some inexpensive sponges so the tattoos could be applied quickly to wiggly toddlers! I’m personally not a fan of the little bags of trinkets and style candy often given as party favors. I wavered a lot on what I wanted to give to all the kids and I settled on these little sports balls and the “pop it” fireworks since his birthday is between two firework holidays here in Utah. I had just had a baby two months earlier, so I wanted to do the food really easy. We had watermelon, chips, catered subway sandwiches and blue punch. I ordered the cake from a local mom who makes the cutest cakes. The cake was adorable and the food was so easy, but I think this year I’ll try cooking and baking myself since I won’t have a newborn. I’m so happy with how this party turned out. It was easy, inexpensive, and stress free other than the normal party throwing anxiety. All of the kids had so much fun and my son felt very loved. That’s what really counts! 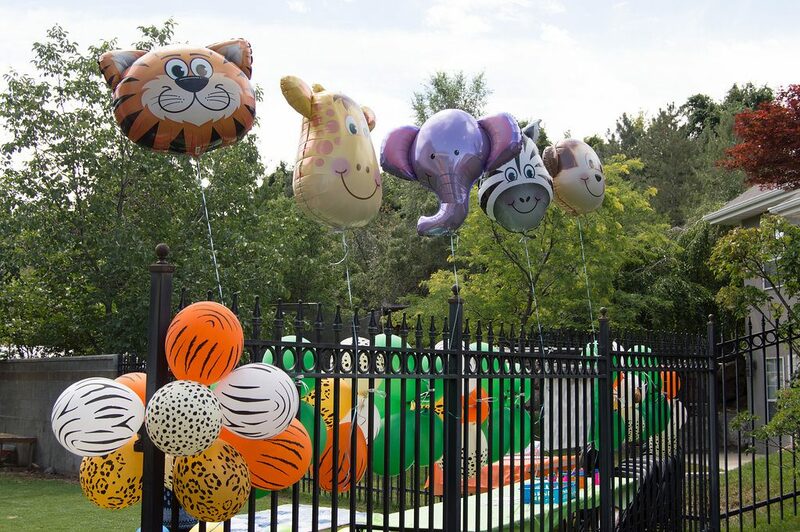 I’m starting to think of ideas for my boys’ 5th and 3rd birthday parties this year and I keep remembering the fun and simplicity of this party! What is your best tip for a successful and fun birthday party?